The Wesleyan University ranking is as the 15th best liberal arts college in the states by the USnews, and the 15th best college in the US by Forbes. The total composite SAT Score range (middle 50%) for accepted applicants is 1300 to 1480. The requirements for previous ACT admissions (25th-75th percentile) at Composite are 29 – 33. The Wesleyan University tuition fees are $47,972 for both in-state and out of state students. It is a very selective college accepting 20.4% of applicants. Wesleyan University is a Private university situated in a small city locale in the city of Middletown, Connecticut. Presently, there are 3,205 at Wesleyan. Of these, 2906 (90.7%) learn at the undergraduate level, and 299 (9.3%) partake in postgrad courses. At the undergraduate level, 2899 attend full-time and seven attend part time. Location wise, 8% come from out- of-state while 92% are from in state. There are about 8% of students from abroad. There are 1504 women attending Wesleyan University, and there are 1402 men who study at the undergrad, for a ratio of approximately 48:52. Regarding ethnicity, the undergraduate student body is broken down to 53% Caucasian, 8% of Asian descent, 7% African-American, and 10% with Latino or Hispanic backgrounds. The U.S. News & World Wesleyan University Ranking Report presently considers the academic establishment the 17th best liberal arts college. 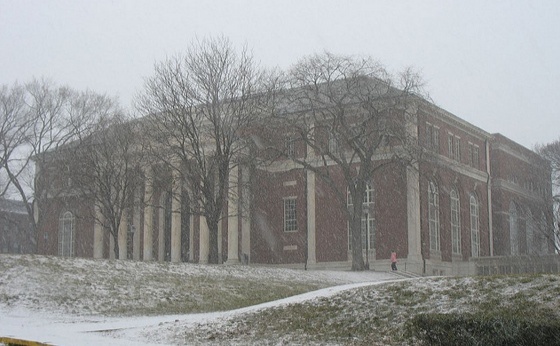 Photograph of Olin Library by Brendan Dolan-Gavitt. The Wesleyan University tuition fees for attendance are $46,674 for people from in-state, and the same for those coming from other states. It is necessary to add a further $12,940 for university accommodation and food, $2,665 for study books, and $570 for administrative fees. This brings the overall costs to go to at this college to $62,849 for both instate and out of state students. Wesleyan provides needs based funding for scholarships of $52,575,560, and has non-needs based funding of $1,073,788 available, making a total of $53,649,348 accessible in grant-aid to their students. The average monetary aid given to each student is $34,842; around 58% of students receive assistance with finances. Wesleyan University is a very selective school with acceptance rates of around 20%. In the previous year 10,657 applied for admission, of which 2190 received acceptance. Of those receiving admittance letters 748 (34%) enrolled at the university. The application fees for the establishment are $55 for both UG and post-grad study. Of the students accepted, 67% were placed in the highest 10% at their high school classes. 70% of future students presented SATS. The median scores for reading were 700-800 (56% of all accepted applicants), 700-800 (59%) for Math, and 700-800 (59%) for writing. The mid fifty percent percentiles were 635 – 740 at reading, 660 – 740 at Math, and 650 – 750 for writing. Thirty percent of students gave ACTs: median ranges are 30-36 (71%) for Composite, 30-36 (80%) for English, and 30-36 (71%) for Math. The twenty-five to seventy-five percent percentiles were 30 – 33 Composite, 28 – 33 for Mathematics, and 30 – 35 English. Some of the most important admission factors for acceptance into the institution include secondary school record. Other important factors for entrance include essay, personal qualities, particular ability, recommendations, standardized test scores, minority affiliation, and class rank. The address for applications to Wesleyan University is 237 High St Middletown, CT 06459. The tel. number is (860) 685-2000, and the admissions website is located at http://www.wesleyan.edu/admission/. The college proffers approximately 900 courses (40 departments; 44 major and 7 minor fields of study), with the most prevalent being Government, Psychology, and Economics. Class sizes are as follows: less than 20 (68%), 20 – 49 (26%), and 50 and more (5%). The school has more than 340 buildings, with the main campus being found at a small city location in Middletown, CT. In all, the campuses cover an area of 360 acres. The university’s sporting teams compete at the NCAA DIVISION III level of the New England Small College Athletic Conference. The sports teams are known as the Cardinals. Men are involved in 13 varsity sports, while women take part in 12 events, making a total of 25 varsity events. The college currently employs in the region of 375 full time faculty, and 339 part-time (giving a total of 714). The student: teacher ratio is 9:1. Around 89% of new undergraduates graduate the school within four years, and 93% complete within six years. In the previous year, 876 students graduated the university; they received 785 degrees at the Bachelor’s level, 81 Master’s, and 10 Doctorate’s. 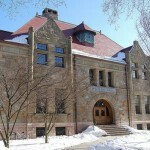 Although Wesleyan is an expensive institution to attend, costing in the region of $50,000, it is still considered to offer good value for money due to the work of its financial aid office, it is often able to help students attending the college who are not in receipt of scholarships by working to reduce fees. For those who are receipt of a scholarship it is a bit of a no-brainer to attend Wesleyan University as it offers an excellent standard of education. It is thought to offer a more personal learning experience than Ivy league and public Ivy schools that offer a similarly excellent learning culture. Most people say it is easy to socialize and make new friends, however those looking for an exciting Greek experience may need to look elsewhere as Greek life tends to be quite low key. As a prestigious institution it is no surprise that students feel that they are learning a lot. Many students state that the academic courses tend to be reading intensive yet still remain stimulating due to the college’s philosophy of learning for the love of learning. As is to be expected the workload is heavy, but the university helps out by offering instruction in time management. The dorms are considered to be nice with most people given single rooms in their freshman year. Unfortunately, due to an expansion in numbers of people attending Wesleyan in recent years many freshmen may need to share triple rooms (at a reduced cost). The dorm buildings are themselves very characteristic, and most people consider dorm life to be a lot of fun. The food on campus is considered to be great with all tastes catered for. However it does require a meal plan. If you are beginning to get a little bored with the universities offerings then you will be pleased to now that it is easy to get food delivered from the many restaurants in the nearby town. Middletown, itself contains a cinema and lots of shops that cater for students needs. Furthermore it is easy to access the nearby major cities of NYC and Boston if you want a complete change of pace. 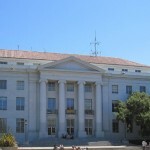 Students do not consider security in campus and in town an issue. Overall, most students feel that Wesleyan offers a fantastic education and life experience, but consider it an expensive place to study at if you are not in receipt of a scholarship or other form of financial aid. Other colleges in Connecticut state include the University of New Haven, University of Connecticut Health Center, University of Connecticut, Yale University, and Southern Connecticut State University.